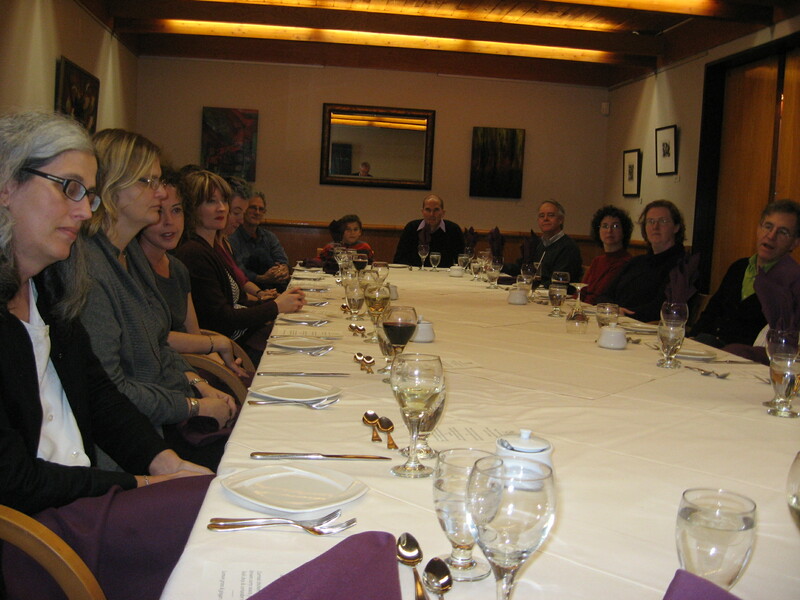 A week or so ago the English department faculty staff met for lunch at the University Club. What was the occasion? We were celebrating the extraordinary work done by three of our colleagues over the past year. First we acknowledged Dr. Shelley Hulan, who headed up the organization of all of the events associated with the English department’s 50th anniversary. From a BBQ to a conference, and much in between throughout the year. Many of you helped us celebrate that wonderful anniversary year with us, and we were really glad to be in touch with you. Thanks to Shelley and her team for doing such a superb job. Work done with great efficiency and good humour. Shelley made everything look effortless, but we know how much work went into creating and executing the numerous events (not to mention applying for money to pay for them) that took place. We even have commemorative coffee mugs and T-shirts! Dr. Kate Lawson was our Associate Chair undergraduate studies during a particularly important year: we had to do a self-study, explaining ourselves to others who review the curriculum, our mission, the output and satisfaction of faculty and students, all of the general WORK that our department does with and for undergraduate students. Someone has to write a self-study report (hundreds of pages long, with appendices) and host the external reviewers who come from other universities to evaluate our department. Kate did a fantastic job. But she didn’t stop when the review was complete. Along with performing with aplomb all of her other duties as Undergrad chair, she left us a legacy to build on: a new map of the undergraduate curriculum (which we are still working on), a bunch of new first-year courses and a refreshed sense of what we want to achieve in first-year teaching, and two new undergraduate specializations: one in Digital Lives and the other in English in Global Contexts. Awesome. And then there was Dr. Ken Hirschkop, who was Associate Chair graduate studies for the past 3+ years, also during a period when we had to do a self-study of our graduate programs, etc. As above, this involved lots of data collecting, writing, framing, explaining, hosting and responding to what reviewers said. Plus, during his tenure our graduate student cohort grew considerably, we got more funding for graduate students, a more international graduate student body–and more. Splendid job! Toasts were made. There was wit and laughter. There was performance–I’ll never forget current Associate Chair of graduate studies Dr. Randy Harris’s “toast,” a hilarious Monty Pythonesque bluster about Ken’s achievements. The three who were being specifically thanked were gracious in their responses, acknowledging that there is remarkable collaboration and cohesion in our department. There was great food and generous wine and lots of good feeling. ‘Twas truly a jolly event (though we look rather serious in this photo because we are listening to a speech). We celebrated one another, and we celebrated ourselves. Yep. It was a bit of a love-in.